Pinewood Drive Holiday home a property with barbecue facilities is located in South Lake Tahoe 1.8 km from South Tahoe Ice Arena. 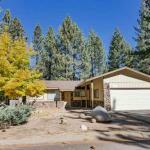 The property is 3.5 km from Tahoe Queen and 3.9 km from Heavenly Ski Resort. This holiday home comes with a kitchen a seating area and a TV with DVD player. Washoe Meadows State Park is 6 km from the holiday home while First Ride is 4.2 km from the property. The nearest airport is Reno-Tahoe International Airport 67 km from Pinewood South Lake Tahoe.